Photo challenge: show us a thing or place you think is an extra. This is India, so who’s extra, the cow or the dogs? – Benares, India. Yes, the cow is big but maybe she’s more at home than the dogs. She almost seemed to be waiting for someone to open up, having forgotten the home keys. Brilliant shot. One imagines the expression on the cow’s face; its stance suggests great nosiness. this is great – it is like he is waiting to go inside – and the dogs feel like the extra – but what a fun shot…. Since the cow’s sacred, I’d have to say the dog is extra. But who cares? It’s a wonderful photo. Great shot Stefano. I think the cow is the extra. Genial!!! Una pasada Stefano!!!!! Me encanta!!! 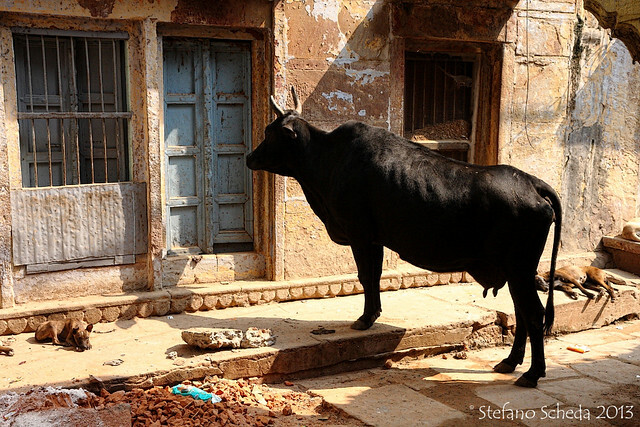 Cows rule in Varanasi so it would have to be the dogs, but by a close margin 🙂 Great shot Stefano!